Black Panther (Blu-ray Disc, 2018 + Digital Code) W/ dust cover New sealed ! I was really excited to see this movie come out as I really liked the first one. It is hard to find a good action show that is also very 'clean' for the whole family to watch. This series has done an excellent job at that. While I did enjoy the movie, I didn't think it was nearly as good as the first. I agree that they did rush through the scenes of finding the clues in the desks. He just happened to lay down under the desk without looking around it first, just happened to pull the drawer out from under it and see the numbers, then recognize them as a combination, then just happened to get the combination right on the 2nd try. Again, they could have played this part out a bit more so it didn't feel so contrived. I also left not knowing what to think of Ed Harris' character. Here is a person that, throughout the show, played someone who had no problem killing to get what he wanted. In the end (without giving away any details) it felt like they wanted you to like him or think of him as a good guy. I really feel they needed to make up their mind on this character. He did a good job acting the part, but the character could have used a bit more work. Overall a great family watch and I will watch the next one when it comes out! There are several excellent reviews, as well as some rushed ones, of this movie already in the Reviews & Guides. What they all have in common is the 5-star rating they give this movie. I give the movie 4 stars, not because I didn't thoroughly enjoy the movie, but because I feel that the differences from National Treasure #1 were not changes for the better. Specifically, there are far less quirky details about American history, the founding fathers and unique pieces of Americana. This has been replaced with a lot more bantering between spouses, Ben Gates and his sometimes estranged wife, Abigail, and now Ben's parents (played admirably by Jon Voigt and Helen Mirren). The plot revolves around Ben's struggle to clear a direct ancestor of complicity in the assassination of Abraham Lincoln. 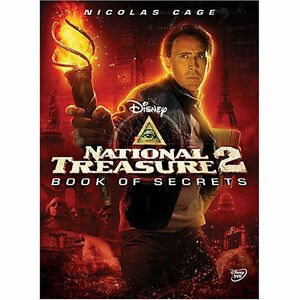 While the National Treasure premise is based on some incredible coincidences and unrealistic encounters, all in fun of course, National Treasure 2 really pushes the envelope with break-ins at Buckingham Palace and the Oval Office and ultimately, kidnapping of the President of the United States. Kudos to Ed Harris, as always, for a sterling supporting performance as the "villain" of this installment. Another action packed, edge of your seat thrill ride!! If you liked the first one, you will like this one! Another action packed Nicholas Cage thrill ride. This movie seemed a little more far fetched than the first one, just because you knew what to expect so they had to make it a little more fantastic than before. My biggest complaint about this movie is the way in which Nicolas Cage's character puts some of these "clues" together so easily. It's awfully amazing how he can take some fantastic clue and be able to follow it so easily. I took my wife, and two boys (10 & 7) and we all had a wonderful time. Our 7 year old found a couple of areas 'scary' but it was more just the music and the threat that something bad could happen. All in all, it's a very family friendly movie that all the members of your family should enjoy. Benjamin Franklin Gates and crew are back - not in search of treasure so much as in clearing Gate's ancestor of plotting Lincoln's assassination. The good news is that the original cast is intact and adds Helen Mirren. Of course, there must be a new villian and Ed Harris, as usual, dominates the screen. As in the first, the race is on and again spans a great part of the globe. At the end of the search there may be a treasure after all and the way is left open for another sequel - based on page 47 of the Book of Secrets. In fact, hints as to what the book includes could provide enough plots to make this franchise equal that of James Bond. One quibble: There is a similarity between the climaxes of this and the previous movie, as though the imaginations of the creators were exhausted. Be more original next time, fellas.